Arriving in Copenhagen, you’d be forgiven in thinking there is nowhere else to visit in Denmark. However, three hours west sits a city often forgotten about. Aarhus, the second largest city in Denmark, is home to a cultural revolution. Chosen as the European City of Culture for 2017, FERMENT magazine was invited on a tour of the highlights of Aarhus – from Michelin star eateries and laid back bodegas to lush landscapes of farmland and forest, both dramatically embracing the Ocean. Aarhus’ relatively inaccessible nature actually serves as one of its greatest attractions. From Copenhagen, unless taking the ferry, you must cross the incredible Storebælt. Translating as ‘Great Belt’ it could not be more suitable a name. Spanning nearly seven kilometres the traveller is treated to massive expanses of water – a truly incredible example of civil engineering. The town of Aarhus itself is much like any other European City, a plethora of bars and coffee shops with a sprinkling of cafés selling the Danish speciality ‘Smørrebrød’ – a visually pleasing, open-faced sandwich. A more interesting feature, perhaps, is the cultural and societal smorgasbord (yes, that’s Swedish not Danish). A great viewpoint from the top of the sleek Comwell Hotel building allows you to truly see this charm in action. Towering factory chimney stacks fight for space on the skyline with beautiful, copper tinted church spires whilst lush forests fend off the lazy approaches of the North Sea. The first restaurant, Substans, was a modest but attractive offering on Frederiksgade. Boasting a recent Michelin star this restaurant aims to deliver solid craftsmanship and exceptional taste using organic ingredients from local producers. The diner can truly see how much the young, enthusiastic staff appreciate the quality of the ingredients they are using to create their stunningly stylish taster menu. As a relative (or total) novice it was a staggering experience. Make sure to try the eight-hour slow roasted pork belly, accompanied with a brown sugar and carrot reduction, accompanied by dehydrated carrots. Of course, these were accompanied by another eight courses and a range of wines, the Wechsler 2015 Reisling being a particular standout. The 1400DKR may seem off-putting, at roughly £175, but what price can you put on happiness? As it turns out, it’s £175. What is apparent is the approach to fine dining that is taking over in Denmark. There is no need to pack a dinner suit; shorts and t-shirt will do nicely. So long as there is an appreciation for exceptional cuisine using local ingredients you will always be made to feel welcome. With that in mind, it’s interesting to see the true success of the Danish food culture. Denmark has 5.6 million inhabitants but produces enough for nearly three times as many. The ever-growing emphasis on organic, home-grown produce has led to an equalisation of cost, meaning high quality produce is now more accessible than ever. One of the men spearheading this effort is owner of Troldgaarden Philip Dam Hansen (www.troldgaarden.dk/). Upon visiting his farm south of Aarhus, it’s immediately obvious why there is so much said about this place and this man. With great passion, Philip and his mother have become known for their incredibly high standards of welfare and quality, and have partnered with various Aarhus restaurants to help put them on the map. Philip’s modest laid-back attitude does not match up to the staggering workload the 27-year-old has on his hands. From hand rearing pigs to caring for the rows of extraordinarily red apples, producing incredible charcuterie and even appearing on Danish farming reality television, it’s amazing to think what the future holds for this young farmer. An emphasis on the value chain, the start to finish production of a product, is producing incredible results. The gigantic pig farms may still be necessary to meet the 28 million pig production needed, but it’s apparent that the Danish public are becoming more aware of the welfare issues and appreciate the massively improved quality. As Philip says, he wants to “ignite the organic spark in everyone”. I can think of no better person to do it. From the graft and grit of the farm, we moved on to somewhere on the other end of the scale. Frederikshøj (http://frederikshoj.com/) is the restaurant of Wassim Hallal, an eccentric and ambitious chef who prides himself on the unpredictable nature of his food. Originally from Lebanon, Hallal came to Denmark aged four and appears to have been involved in the restaurant industry ever since. Entering the restaurant, you could not be blamed for feeling a little overwhelmed. Greeted like a hero or a long lost family member by silk-gloved men, we were led to our seats by director Jeppe Lund. Opting for a more traditional menu, we explored some of the various Smørrebrød which helped Wassim Hallal fall in love with Danish food. We started with rye bread loaded with a mix of juicy shrimp and dill cream, topped with a poached egg and shavings of truffle. Following this was a more traditional fried fish offering and, finally, an incredibly tender, rare beef and woodsorrel plate. After a meagre hour’s digestion, we headed off to the start of our restaurant crawl. Restaurant Domestic was the first stop. Hidden away down a small lane called Mejlgade, Restaurant Domestic (www.restaurantdomestic.dk/) and its chefs build courses around Nordic ingredients from local farmers and wholesalers with, again, more than a little thought for animal welfare and sustainability. Despite the slightly hidden entrance, the restaurant itself is sizeable, even featuring a 20-foot well, for no easily discernible reason. The food itself was, again, outstanding. Among the courses were impressively thin slices of carpaccio, decorated with nasturtium (a common feature of Danish cuisine, seemingly) and miniature pork belly pies with a kick of fermented fennel. The fermentation craze is alive and well here, with jars of varying sizes surrounding the entire restaurant. This wonderful experience was made only better by a reminder that we must visit the next restaurant – Haevaerk (restaurant-haervaerk.dk). A beautifully eccentric establishment run by the youthful Rune and Michael, Haevaerk has no set menu. It’s easy to write about what offerings they had, but the likelihood is, should you visit, it will be completely different. The true eccentricity of the chefs was displayed in their clear attempts to turn every living or dead object into some form of alcoholic liquor – my favourite being the sweetcorn schnapps. The seven courses with wines, while Instagram-melting, is relatively inexpensive at only 350KR (around £40). But what FERMENT outing to Denmark would be complete without an exploration of the local beers? For this reason, I headed (rolled) to the famous Aarhus Food Festival (www.foodfestival.dk) to meet some of the brewers helping turn Denmark into a true beer destination. 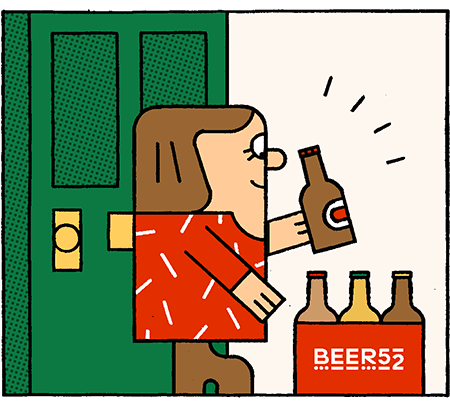 While it’s difficult to look past Mikkeller as the titan of Danish craft beer, he has some very accomplished peers. Holbaek Bryghuset no 5 produces a fabulously refreshing elderflower ale, with hints of orange and lemon, simply named Hyldeblomst. If you are a fan of the stronger stuff, try the Kloster Bryggeriet imperial Russian stout – an inimitable 10.5% monster. I also had a chance to speak to the special Scandanavian sibling (somewhat) of CAMRA – Ølentusiasten. This army of 9,000 beer drinkers are demanding better beer and will go to all sorts of lengths to show the Danish populace the incredible range of beer available, from small breweries to large, local to international. After a back-and-forth, I shared an aptly named Brew42 ‘hopsession’ with a traditionally dressed man. While it was a struggle to hear him over the gaggles of beer enthusiasts, it was easy to see his unfettered enthusiasm. If you ever happen to become a Danish citizen it would be a crime not to join this exciting club. I returned to the main arena, slightly worse for wear, to watch the finale of the hotdog championship. While it sounds ridiculous – and in a way it was – it was a fascinating spectacle. Some of Denmark’s best chefs offer their reinterpretations of the classic hotdog. I was lucky enough to try the winning sausage, ’dog of the dead’ by English chef Paul Cunningham of restaurant Henne Kirkeby Kro - a Mexican-inspired effort with an apocalyptically hot dressing. Meanwhile, in the background, the aforementioned Philip Dam Hansen stood atop an army vehicle proudly displaying his hotdog collaboration with Restaurant Sårt to the judges. It was then I think I finally decided I love this place. Strange and unique, mystifying and chaotic, a true pleasure.